My love for politics started back in 1996 when I visited Myanmar and found myself at the cusp of a student riot and political change. To cut the long story short, it made me deeply interested in politics- the art and the science of things, and I ended up double majoring in psychology and political science with special interest in political campaigns, elections and how all of that impacts world politics. Needless to say, US elections hold particular fascination for me since the impact of the person sitting in the Oval Office holds sway for the world, world politics and world policies. 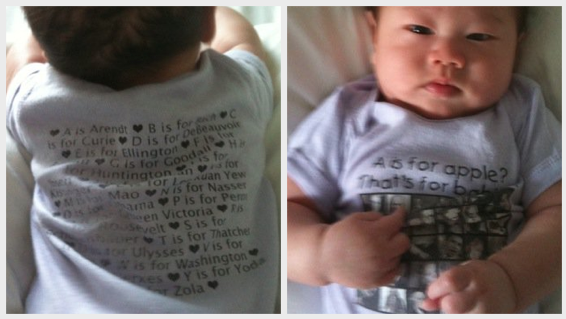 Wun and I took leave in 2008 to watch America elect their first black president (I would have preferred Hillary personally) and when Q was born, our good friend and fellow Politiko Aunty Karyn made Q his very one ABC onesie: A is for Arendt… N is for Nasser…T is for Thatcher… Y is for Yoda. When our local elections took place (GE2011), we let Q stay up with us to wait for the results, explaining to my not yet 2yo who Lee Hsien Loong was, who the men in blue were and he clapped and cheered along with us at the various speeches and all. Somedays, instead of our usual ABC 123 lessons, we teach him about the great people in the world; a modge-podge of world leaders and other notable characters that have shaped our world. When Neil Armstrong died, we learnt about the moon, talked about the Mars Explorer, looked at photos, built mock Apollo 11z, re-created walking on the moon (not the moon walk; we walked on sponges) and pretended to be aliens. Yes, its important our kids learn their ABCs, 123s and all the other classroom stuff… but we also think its darn important they learn about the world. This entry was posted in discovery, education, generation now, life, life learnings, politics, Things to do, world affairs and tagged 123, ABC, arendt, elections, elections2012, famous people, GE2011, learning, myanmar, political science, politics, riots, thatcher, USA, world affairs, yoda by matchingsocks. Bookmark the permalink.